Have you ever had the thought, "I need a weapon to protect myself, but I don't want to carry a gun." The Arc Angel Stun KatanaTM is the responsible solution. It is not a gun. It is not lethal. You don't need a license to own it. It is safe to use and easy to store. 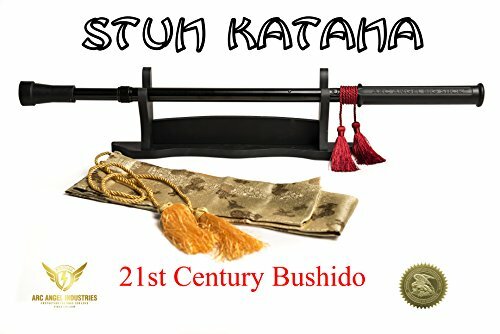 STUN KATANATM Fully Functional Supports 350 LB. Max 1,500,000 Volts Stun Device Safe and effective at the same time Key and Safety Lanyard included Home Charging Unit included Foreign Plug Converter included Fully Rechargeable NiMH Battery System for thousands of Flawless Charges High Quality Aircraft Aluminum Construction Packaged weight: 2 lbs Includes Silk Sword Bag with Traditional Tassel. Stand sold separately.